The date on that is Jan 7th 1986. I'm glad I found this certificate. I mistakenly thought I got my Atari in 86 but this tells me I got it in 85. It was my modem I got in 1986. The year was 1985. Halley's Comet was coming. The Space shuttle had 24 successful launches and seemed to be commonplace. Even Atari had a home version of a shuttle pilot game. Other space games let you explore vast universes. 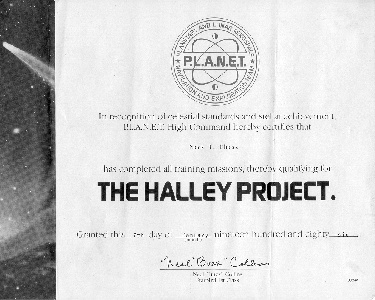 Then a game called the Halley Project came out that let you explore our own solar system. And it had the capability of doing it in real time. The hardest part about this game was the navigation. You needed to use real star charts. The questions I have gotten over the years about this game were all about the map. I don't remember it having any. I had to buy a book, called the field guide to the stars and planets, to get a chart to play the game. You push the joystick to go in a direction. Hold the button down to change your view without changing your direction. 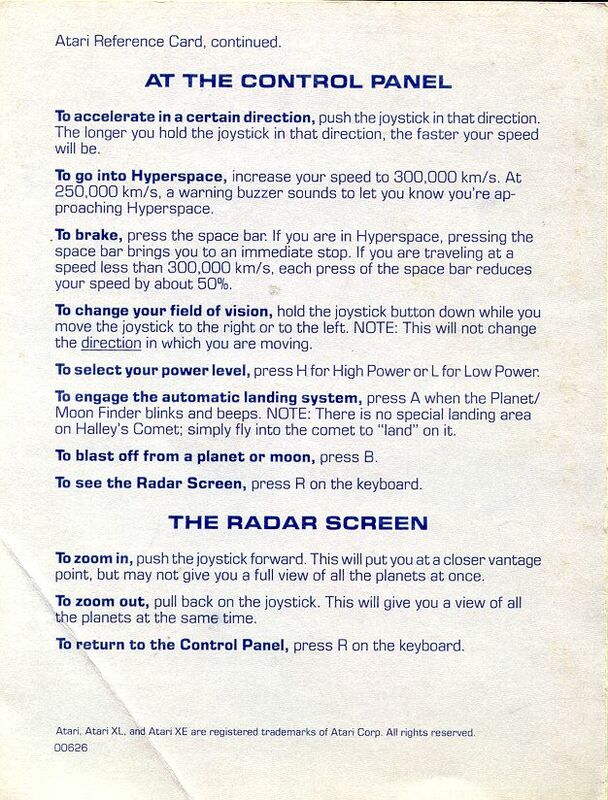 300,000 km/s puts you in hyperspace and the space bar puts on the brakes. H for high power L for low power. Press A for automatic landing when the planet/moon finder beeps. Just fly into the comet to land on it. B to blast off and R to see the radar screen. R to leave the radar screen also. Piece of cake. Real space flight simulation? Sure it would take months to get from planet to planet if you didn't turn the time compression on by jumping into hyperspace. And navigation was done by looking at the constellations and plotting your course that way. So much hype with the comet and the program out at the same time. By the way. There is a secret 11th mission. This mission was the subject of a contest. The first person to complete the 11th mission and send in the message and get selected as the winning entry was the winner. Basically when you finished the game you were given a code that you sent back to Mindscape. Then the top secret message came in the mail a few days later. I still have the letter, here is the secret mission instructions. 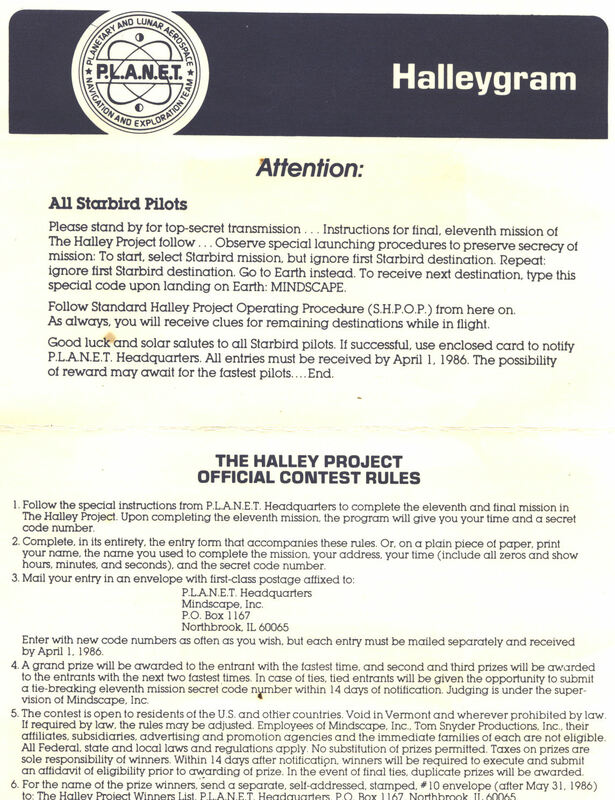 First select the Starbird mission. But instead of going to the first destination of the Starbird mission instructions go to Earth instead. And you know while on a mission when you land at the destination you have a special code you type in. So when you land on Earth your special top super secret code is "MINDSCAPE" There you will be given the mission details for the secret 11th mission. And if you completed it and returned the special entry card with the final code before April 1, 1986 you were eligible for the prizes. The postmark on that letter shows Feb 6th 1986. This paragraph is being added 5 years after this initial page was written (Jan 2004) because I finally remembered something. Do I have to write about the events of January 28 1986? The 25th Shuttle mission. Like I mentioned earlier they were commonplace by then. I happened to be stopping by at my parents house when the Challenger liftoff got it's initial 90 seconds of live news coverage. And unfortunately another minute later got much more coverage than that. I had spent a few weeks playing a space game. And then the (first) Shuttle tragedy took place. I know I continued playing that final mission but I do not remember the details of beating it. I would love to hear from the person who won the contest. You know how they have the little disclaimer about sending a self addressed envelope for a list of contest winners. I wonder if anyone ever does that? People stopped by to read about the Halley Project Or Challenger Shuttle Disaster.